A grease trap is a appliance that is used to collect and remove solid material and especially fat, oil and grease (FOGs) that could enter the sewers from your kitchen. They should only have wastewater from kitchens flowing through them. No other wastewater from other drainage system sources, such as toilets, should be allowed. Removing FOGs, can reduce the number of drain blockages you might suffer and also prevent huge fatbergs in the main sewer system, bad smells, disruption in the street and possibly pest infestations. There are two types of grease trap: above or below ground. When the waste water from your kitchen enters the trap, it flows first through a sediment basket which removes larger solid particles. The grease in the water is less dense (“lighter”) than water and doesn’t mix with it, so it floats to the top. Grease traps have to be cleaned regularly to remove these FOGS, otherwise, they build-up, and can eventually overflow through the outlet and even back-up through the inlet. Special cleaning materials can be used to reduce or prevent FOG build-up in internal piping. You should check whether these are allowed in your area, before using them. Not all water authorities allow their use. A large amount of fat, oil and grease (FOG) is produced by commercial kitchens and food establishments in the UK every day. If left untreated or not removed before joining the main sewage system, it can cause major issues with main sewers and a huge amount of disruption to businesses as it is cleared. In the UK, it is a legal requirement to install a suitable grease treatment system for effective FOG removal from wastewater from commercial hot food premises. Grease traps must be cleaned regularly to work effectively. Follow the manufacturer’s instructions, where provided. This will probably include instructions for removing the lid gently, to avoid damaging the (expensive!) gaskets. If you are not used to cleaning the grease trap, take photographs or draw diagrams as you go, so you can put it back together again! You may be required to measure and record the amount of waste in the trap. Remove any standing water from the grease trap, with a small bucket or basin and leave it to one side as it can be emptied back into the trap after it has been cleaned. Remove any solid waste from the trap, using a small bucket or basin and empty it into a heavy duty water proof container, eg a plastic garbage bag. You will also need to scrape any solids from the top and sides of the trap and add those to the trash bag. Now use suds and warm water to thoroughly clean all parts of the grease trap. Rinse well with water to wash away the suds and any left over bits. Put the grease trap back together again. Use your photos or diagrams to help if necessary. Check it is working (SAFETY!). Then replace the lid and close securely with the correct mechanism. You may need to save or send FOG reports. Grease traps that are not made of stainless steel may be a little cheaper, however, they will last only between 5 and 10 years, as the grease and liquids flowing through it can corrode the metal. This can also be seen in extraction systems where grease can seep through the seams if the system is not kept cleaned and maintained. This means you may need to repair or replace your grease trap every few years. 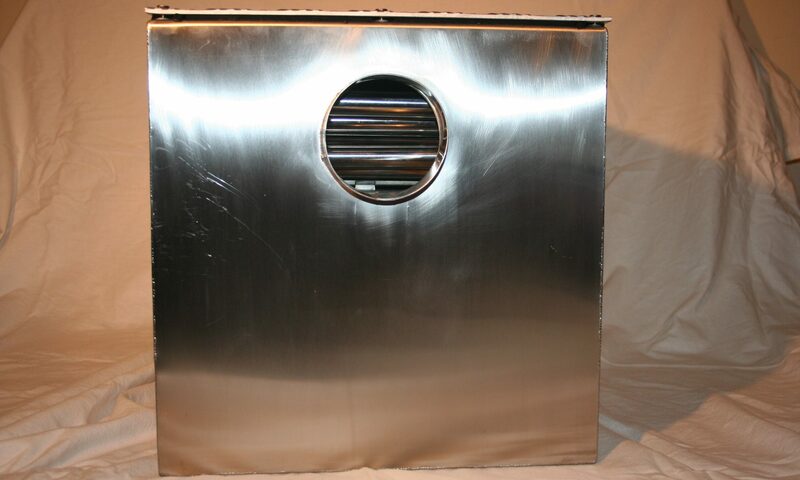 Stainless steel grease traps do not corrode and do not need to be replaced, provided you take care of them and clean them regularly.